All the students and outsiders entering the library shall keep their bags and others belongings at the entrance. Do not leave any valuables at the check point. Library is not responsible for any loss of personal belongings. Books removed from the shelves by users, should be kept on the book trolley or on table nearest to them after use. Please do not try to shelve them yourself. The newspaper(s) should be folded properly after reading and kept back in the designated place. Readers should not deface, mark, cut, mutilate or damage library resources in any way. If anyone is found doing so, he/she will be charged the full replacement cost of the resources as per rule. Books Borrowed should be protected from RAIN, DUST, INSECT, ETC. Students are advised not to issue books to others on their names. Proxy is strictly prohibited. 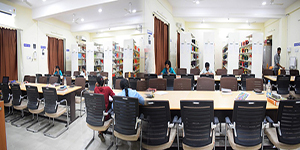 In case, students stays in the campus during the summer vacation and wants to makes use of the Library, she/ he has to get permission from the Librarian on the recommendation of their respective faculty member. Before registering for new semester, all the dues of the library must be clear including overdue books else borrowing facilities shall be withhold. Conversation and discussion disturbs library ambience. Therefore, all are requested to maintain dignified Silence. All users are requested to keep their mobiles switched off or in silent mode in the library. Library reserves the right to call back any issued book/ item at any time. Smoking, eatables and beverages are not allowed inside of the library. Books can be borrowed only upon producing the identity card. Library borrowed books are not transferable and hence should not be lent to others. Users are liable for the damage and loss of books, if any. If the damaged book belongs to a set, then the user is responsible for the entire set. Users should check the physical condition of a book while borrowing the same. Immediately after the issue of a book, the user is required to take out the same from the library. While going out of the library, users should ensure that they do not carry book(s) that are duly not issued on their name(s), failing which disciplinary action will be taken against them. Every user is requested to check the status of book(s) outstanding against his/her name soon after a transaction is over at the counter. Discrepancy, if any, should be brought to the notice of the counter person immediately. Any complaint thereafter is not likely to be entertained. When there is demand for a borrowed book, the same must be returned to the Library. Users are responsible for complying with copyright act while photocopying library document. All outstanding dues in form of overdue charges or lost book must be cleared within the current academic year falling which membership will be treated as delinquency.